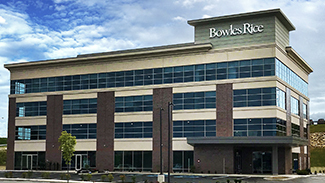 The new Bowles Rice Morgantown office serves clients in North Central West Virginia, southern Pennsylvania and the surrounding region. Located in University Town Centre, the office offers abundant free parking. Take I-79 to exit 153 for University Town Centre Drive toward County Route 46/7. At the traffic circle, take the 3rd exit onto University Town Centre Drive. Turn right onto Granville Square. Bowles Rice is the first building on the left. Use the right 2 lanes to merge onto I-79 N toward Washington. Take exit 153 for University Town Centre Drive and turn right at the end of the exit ramp. Take the next right onto Granville Square.